The second part of Tim’s journey takes him across the Cote d’Armor on the northern coast of Brittany. We left after lunch and continued on journey to our first main campsite on at Pleubian on the Cote d’Armor on the northern coast of Brittany. Leaving Pont Farcy we quickly re-joined the A84 travelling south towards Avranches. At Avranches we took the N175 towards Pontorson. We bypassed Pontorson and joined the N176 westwards towards Dinan. Near Tramain we turned northwest on the N12 towards St Brieuc. After bypassing St Brieuc we turned onto the D6 and then D7 towards Paimpol. Near Paimpol we turned onto the D786 to Lezardrieux and then finally onto the D70 to Pleubian. When we reached the centre of the village of Pleubian we took the D20 to Camping Port La Chaine. 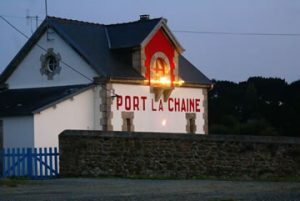 We arrived at Port La Chaine at c18.30hrs on Tuesday 27 July, having travelled 150 miles from Pont Farcy. 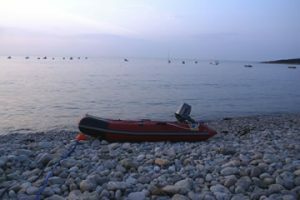 We had researched a number of sites in northern Brittany as we were keen to find somewhere where we could both have a sea view and access to the sea for our Zodiac inflatable boat. After we had chosen a few possible sites we had email conversations with a number of sites to find suitable ones. Port La Chaine was very helpful, emailing a map of the campsite showing suitable pitches. We booked the site on the internet and paid a deposit of 100€ by credit card earlier in the year. The male owner, who spoke a little English, seemed concerned as to whether our ‘van would fit on the agreed pitch and suggested we took a look first, providing us with a map of the site showing available pitches. Our carefully chosen, pre-booked pitch which was near to the sea, for our boat, and had sea views, was far too tiny for our ‘van – it would not have accommodated a ‘van half the size of ours. This was extremely annoying as in our extended email correspondence with the site owners and had made our requirements, including our van’s size, very clear. Fortunately there were other vacant pitches and, after a lot of searching, we managed to find a suitable one with lovely sea views, albeit quite a long way back from the sea shore. The one booked originally had been nearer the sea. Our pitch overlooked the sea with a beautiful view across to the adjacent islands. 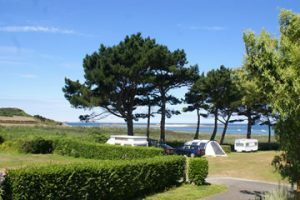 Camping Port La Chaine is a sloping site of 200 pitches set in open coastal countryside at the end of the Presqu’ile Sauvage, or wild peninsula north of the village of Pleubian. The higher pitches are laid in a series of terraces which give single width rows of large-sized pitches. Many of the higher pitches have lovely views out over the adjacent sea and small islands. The lower pitches are set in double rows screened from the sea by a bed of, 2 metre high, sea “grass”. There are lots of attractive mature trees and flowering plants which beautify the site and give shade and the site is very quiet and peaceful. At the top end of the site near the entrance there is a small complex of buildings. The reception office has a range of brochures and information about local sights. There is, also, a small bar with a pleasant outdoor terrace. Bread can be ordered from the bar. Nearby there is a medium-sized outdoor pool but this was rather cold. There is, also, a games room with table tennis table and arcade machines. There is a children’s playground near this area. Free wi-fi is available in the area near to reception. At the end of the main campsite road there is a large playing field with a volley ball net and from there 2 paths lead through the bank of sea grass to the coast. Near to the playing field there is a selection of outdoor exercise equipment. The adjacent small bay is bounded by a long distance coastal pathway. There is a small lighthouse just a short distance along the coast – this is only the size of a house and does not have a tower. A couple of miles along the coast there is an interesting geological phenomenon the Sillon de Talbert. The Sillon de Talbert is a long, thin trail of pebbles and sand stretching far out into the Channel. It is only 35mt wide but stretches for 3 kilometres. The Sillon is formed by the currents in the 2 river estuaries it lies between. We walked part of the way along the Sillon. Far out to sea beyond the tip of Sillon can be seen the Phare des Héaux one of the highest lighthouses off the French coast. The beach is covered with large pebbles and slopes steeply down to what becomes a huge expanse of wet sand at low tide. In the bay there are fixed mooring buoys for small boats but because of the steep slope of the beach these are only accessible at low tide when there is no water for the boats! We drove our Zodiac inflatable down to the sport’s field near to the beach in the car, before inflating it and carrying it down to the beach. We hired one of the camp’s mooring buoys but made little use of it because of the above reasons. This mooring was expensive at £24.00 for a week. We took a few trips out in our boat but found this to be very difficult because of the huge difference between the high and low tides. When the tide was in our mooring was in deep water which made it difficult to reach. In the end we kept the boat on the beach above the high water mark and launched and landed it when the tide was at its highest level. There are no good sandy beaches adjacent to the site so the site is NOT really suitable for beach holidays. I understand that there are sandy beaches nearby, in driving distance, but we did not visit them. The small town of Pleubian is about 2 miles from the campsite. It has several bars, a baker’s, Tourist Information Office and a small “SuperU Express” supermarket. We found the “SuperU” to be adequate for our food shopping and, also, purchased our diesel fuel from its petrol station. There is, also, a small “8.00 to 8.00” minimarket with a Pharmacy nearby. The Tourist Information Office had a good range of information leaflets and an interesting exhibition of photographs of local life. We visited the nearby river port of Treguier for an interesting day out. The river area is very scenic. Near the river there is a public car park where we parked. There is a large Tourist Information Office near to the car park. 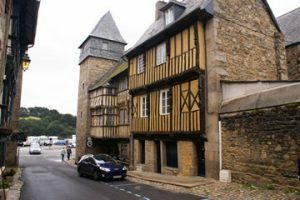 Treguier has a number of historical buildings and Rue St Yves which runs from up from the harbour is a street of overhanging half-timbered buildings. In the central Place du Martray there are a number of touristy shops. The beautiful 14th Century cathedral is dedicated to the 6th Century Welsh missionary St Tudwal. The cathedral has some lovely stained glass and a pleasant flower filled cloister adjacent to it. The Cathedral’s slender spire is unusually perforated with playing card patterns – clubs, hearts and diamonds. The town, also, has a number of interesting second hand shops filled with French bric-a-brac. There are several supermarkets, including a Lidl, and a large souvenir store on the western outskirts of the town. We, also, took a day trip to the Ile de Brehat. This beautiful archipelago of islands is only 10 minutes by regular passenger ferry from the Pointe de l’Arcouest which is under an hour’s drive from the campsite. The small harbour at Pointe de l’Arcouest is surrounded with large car parks for the numerous day trippers to the Island. The main island is actually 2 islands joined by a small bridge the Pont ar Prat. The southern island has the best beaches whilst the northern one is more rugged and rocky with low tide revealing a shoreline of eroded pink-orange rocks. There are a number of holiday homes on the island and the residents push their shopping and luggage around on hand trolleys. The ferry from Pointe de l’Arcouest arrives at the small harbour of Port-Clos. The islands have their own micro-climate and are a home to many exotic plants and rare birds. Brehat is car-free and bikes are available for hire near the harbour. About 500mts from the harbour is Brehat’s main village of Le Bourg. Le Bourg is a handful of houses and shops set around a central green. There are, also, a number of restaurants and hotel catering mainly for the tourist visitors. We spent a very pleasant day walking the lovely flower-decked pathways and taking in the spectacular coastal views to the surrounding islets. We visited the small historic chapel of St Michel set on a picturesque rocky hill and walked to the modern lighthouse on the northern island. There is, also, a ruined tidal mill which can be visited. Another of our days out was to Paimpol, about 15 miles away from the campsite is an interesting port town for a day’s visit. Originally a base for a trawler fleet which fished in Icelandic waters it is now mainly a pleasure port. We enjoyed walking around the town’s 2 harbour basins. 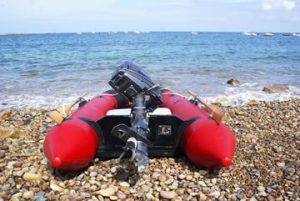 There are a number of chandlers’ shops servicing the needs of the yachting fraternity and we were able to buy some parts for our Zodiac inflatable boat. In the town centre there a good range of shops and 2 large Hyper Marches. A vintage steam railway runs inland from Paimpol with regular timetable of trips during the summer but it was expensive and we did not take the trip. We spent a day visiting the outstanding stretch of the North Brittany coast at the Plougrescant Peninsula. This beautiful stretch is coastline is dominated by huge granite boulders. 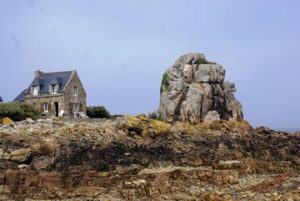 After a picnic on the beach we walked to view the famous tiny 2 story house sandwiched between 2 gigantic granite boulders which often features on posters and in photos in books about Brittany. For our final trip out we drove along the northern coastline passing through a number of small resorts before we reached the larger towns of Perros-Guirec and Ploumanach. We ended our drive at the beach resort of Tregastel Plage. The beach here is part of the Cote Granite Rose and is backed with large pink granite boulders which have been eroded into an array of fantastic shapes. We spent a pleasant afternoon on the beach watching an aerial-acrobatic display by a team from the French air force. The cost of our pitch with EHU for the 2 of us and Max the collie was c£26 per night which I thought was quite expensive for the facilities offered. The owners were quite friendly and helpful and the wife speaks English fluently. We would recommend this site to those who like peaceful rural sites. The lack of a sandy beach makes it unsuitable for a beach-type holiday. It is more suitable for short stays as there was not a lot to do either at the site or in the vicinity. The location was, also, rather remote for travelling to other places. In our opinion it would be more suitable for couples than families for similar reasons. Although it was not the site’s fault we found the weather on the northern coast of Brittany to be much more windy and rainy than Benodet in southern Brittany where have stayed several times. Header banner image credit to Édouard Hue (User:EdouardHue) [CC BY-SA 3.0 (https://creativecommons.org/licenses/by-sa/3.0)], from Wikimedia Commons.